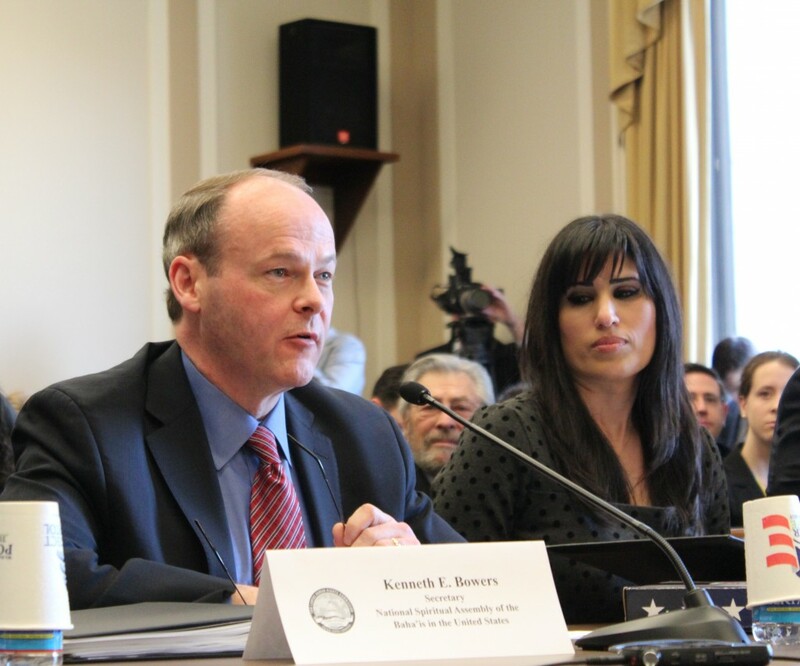 On Friday, March 15 Kenneth E. Bowers, Secretary of the National Spiritual Assembly of the Bahais of the United States, testified at a hearing of the Tom Lantos Human Rights Commission (TLHRC). The hearing featured testimony on the current state of religious freedom in Iran, and highlighted systematic human rights violations against Iran’s Bahai and Christian communities. The TLHRC, a Commission of the US House of Representatives, aims to raise greater awareness of human rights issues among Members of Congress and develop congressional strategies to advocate for internationally recognized human rights norms. The late Congressman Tom Lantos, after whom the Commission is named, was a long-standing champion of human rights globally and a strong supporter of the Baha’is in Iran. During his service in the House, Congressman Lantos co-sponsored nine resolutions condemning the persecution of this religious minority and calling for its emancipation. Bowers’ testimony came after a recently-released publication by the Bahai International Community entitled Violence with Impunity: Acts of aggression against Iran’s Bahai community, which details the escalation of attacks on the Iranian Bahai community between 2005 and 2012, documenting over 225 cases of aggression that include torture, solitary confinement, physical assault, arson of homes and businesses, vandalism, and cemetery desecration. It also highlights the impunity enjoyed by the perpetrators of these violent acts, who are both Iranian governmental officials and unidentified attackers. In his testimony, Bowers also described the persecution of the Bahais in Iran since the Iranian Revolution of 1979, highlighting the increasing pressure on Bahais since 2005. In 2008, the seven members of the Yaran, the former ad hoc leadership group of the Bahais in Iran, were imprisoned, serving 20 year prison sentences. Since 2011, ten instructors and administrators from the Bahai Institute for Higher Education have been detained and are now serving four or five years prison sentences for their efforts to educate Bahai youth. Some 300,000 Bahais live throughout Iran, making the Bahai Faith the country’s largest minority religion. Although originating in Iran in the mid-nineteenth century, the Bahai Faith has become a global religion with over 5 million followers in over 200 countries and territories.